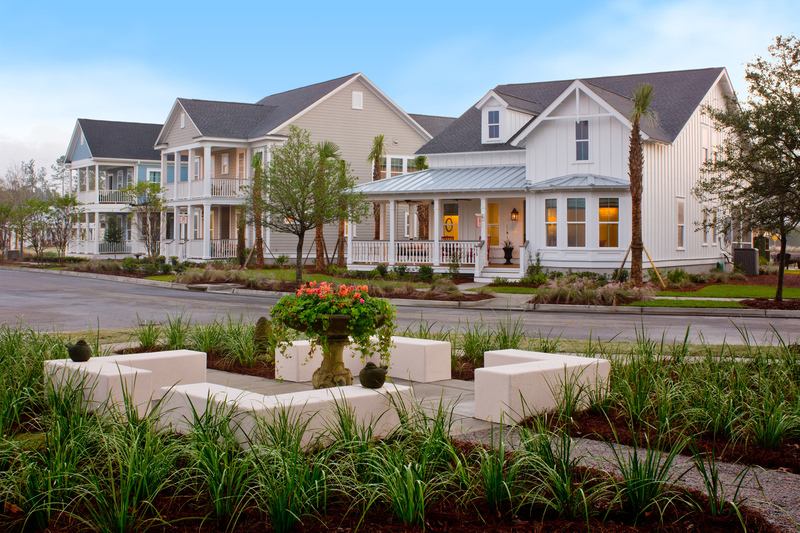 In last week’s blog, we talked about entering the home from the garage into a Welcome Home Valet™ as opposed to through the laundry room. This creates a much better arrival for family members. It also allows the laundry to be moved closer to the source of the clothes – the bedrooms! The goal is to reduce the travel distance from dirty clothes to laundry room and clean clothes back into their closets, containing the mess and making the chore of doing laundry just a little less awful. To cut down the walk to the laundry room even more, you can connect it to the master closet. 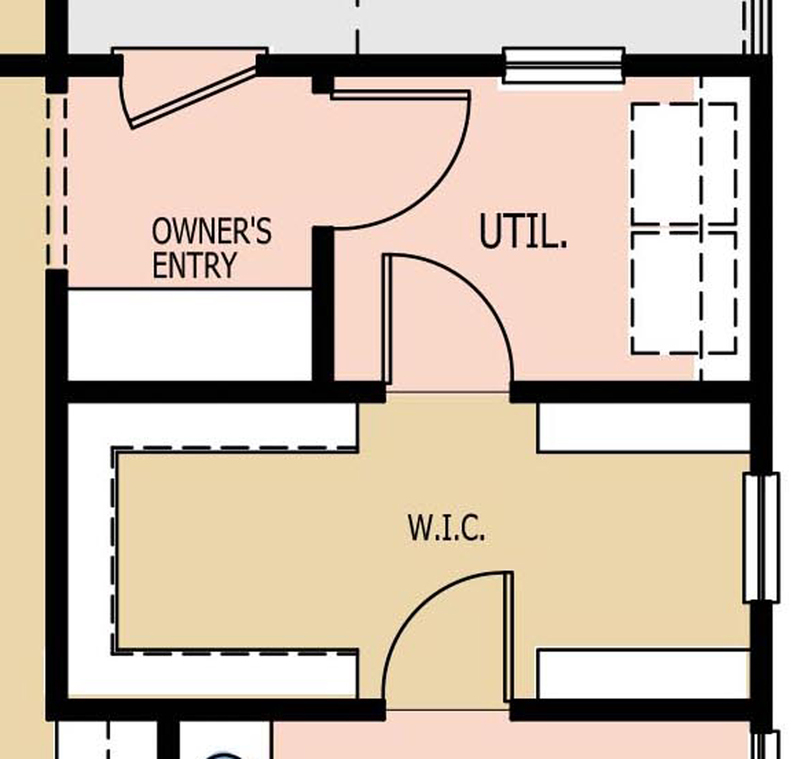 Of course, the laundry room would still have its main door off the hallway so that it is accessible to other members of the household. 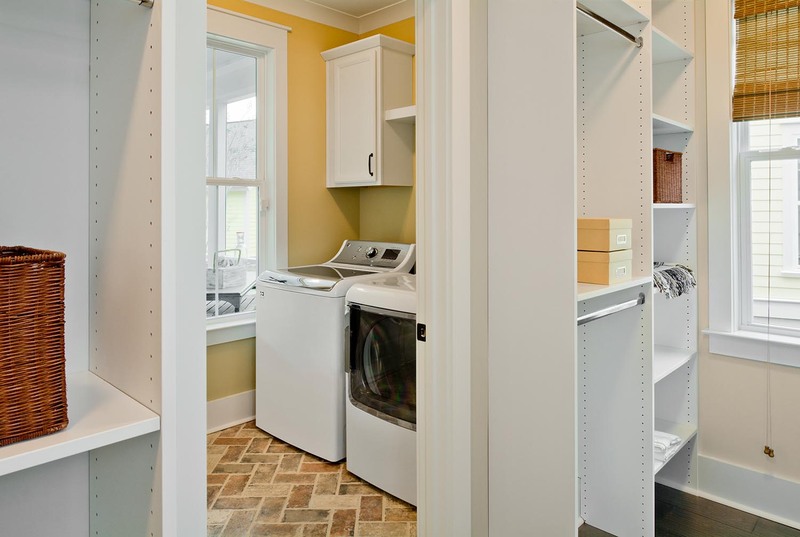 The connection from the master closet to the laundry room can be an optional smaller door. Home buyers have really taken to this new way of thinking. This connection certainly cuts down on the travel distance, it also has strategic byproducts. Imagine you’re running late one morning (okay – almost every morning). You’ve got a big meeting and have picked out in your mind what clothes you’re going to wear that give you confidence. After a quick check in your closet, you discover your “power” outfit has been hung up askew and has a giant wrinkle. Crunched for time, you can’t whip out the iron. So instead, you gently spritz the outfit with water and toss it in the dyer while you continue getting ready for work. In the morning, these seconds count! Or how about this scenario: You’re running late – again – and you discover your favorite “power” outfit isn’t in your closet at all. You know it’s clean – oh wait. Now you remember, it’s hanging in the laundry room to dry. If your laundry room is across the entire house – passed the foyer with the glass front door you’ve got to put on your robe, run to the laundry room, run back and get dressed (no streaking allowed please). 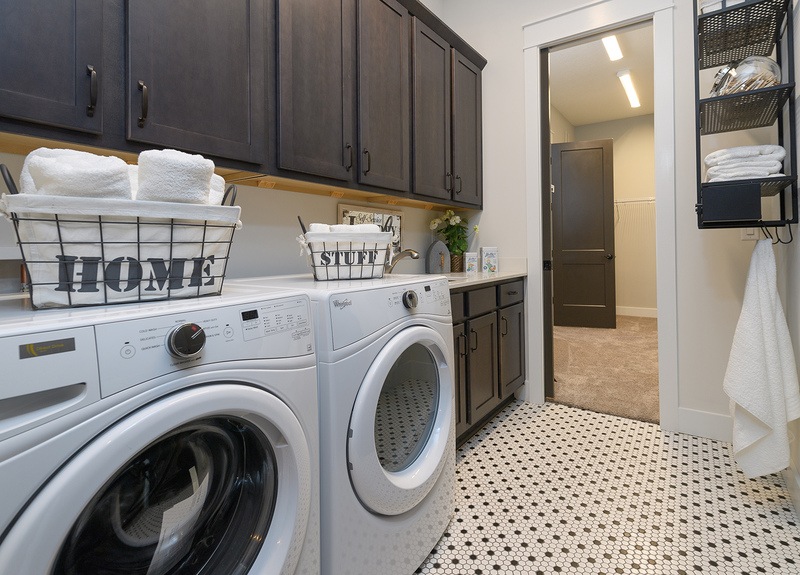 It happens more often than we like to admit, but this could all be avoided with a connected laundry room! A couple of tips about connecting the laundry room to the master. Even the quietest washers can be noisy when they are filling with water. Or who hasn’t had to listen to the clang of riveted jeans in the dyer? 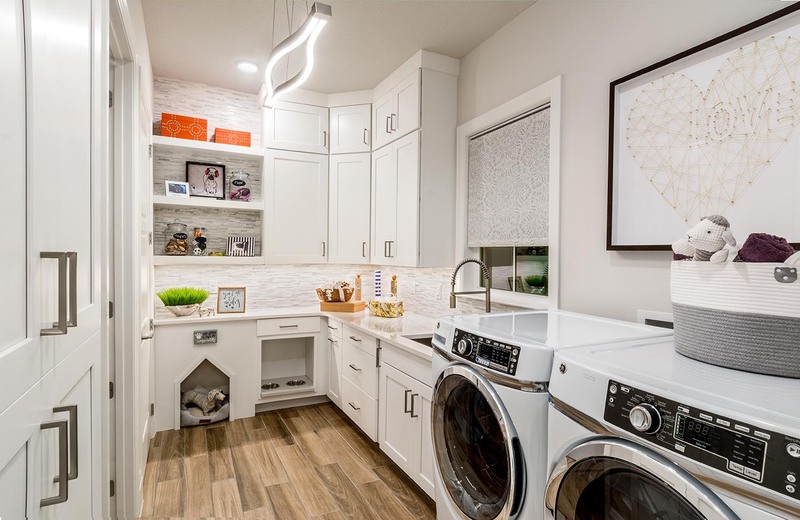 It can be tempting to incorporate a decorative barn door connecting the laundry, but I caution against it, as they are not as effective at blocking sound as a swing door or even a pocket door. And certainly, do not connect the laundry directly to the master bedroom! A closet filled with clothes can also serve as a much needed sound buffer. For most homeowners, laundry isn’t their favorite chore. 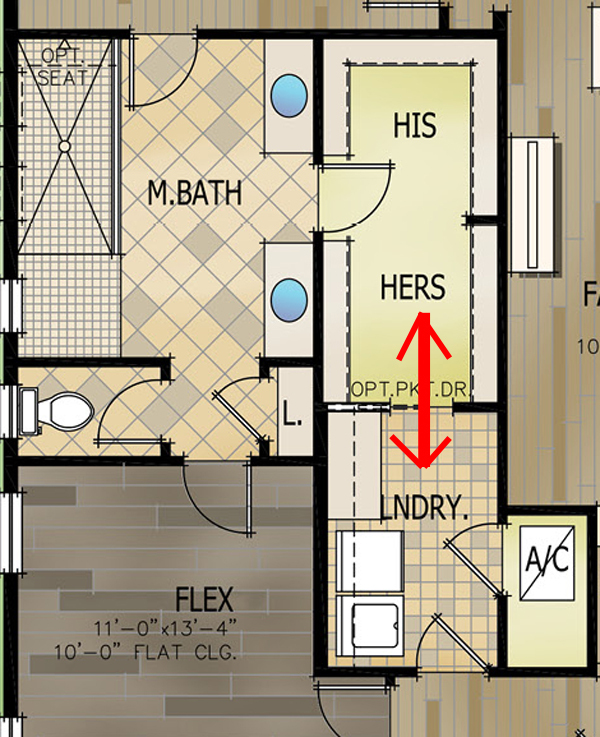 This is why buyers will see the value of a Connected Laundry when they walk your floorplans. Moving the space out of the entry and into the action might even reduce those stressful mornings!